Enjoy guided sightseeing in each city, including inside visits of Tsarevet’s Fortress in Veliko Târnovo, Arbanassi’s Ethnographical Museum and Church of the Nativity, the eclectic rock formations of Belogradchik, and Kalemegdan Fortress in Belgrade. Other highlights: visit the medieval fortress of Vidin, pass through the dramatic Iron Gates gorge, visit the Lepenski Vir archaeological site, and enjoy an organ concert in Pécs. 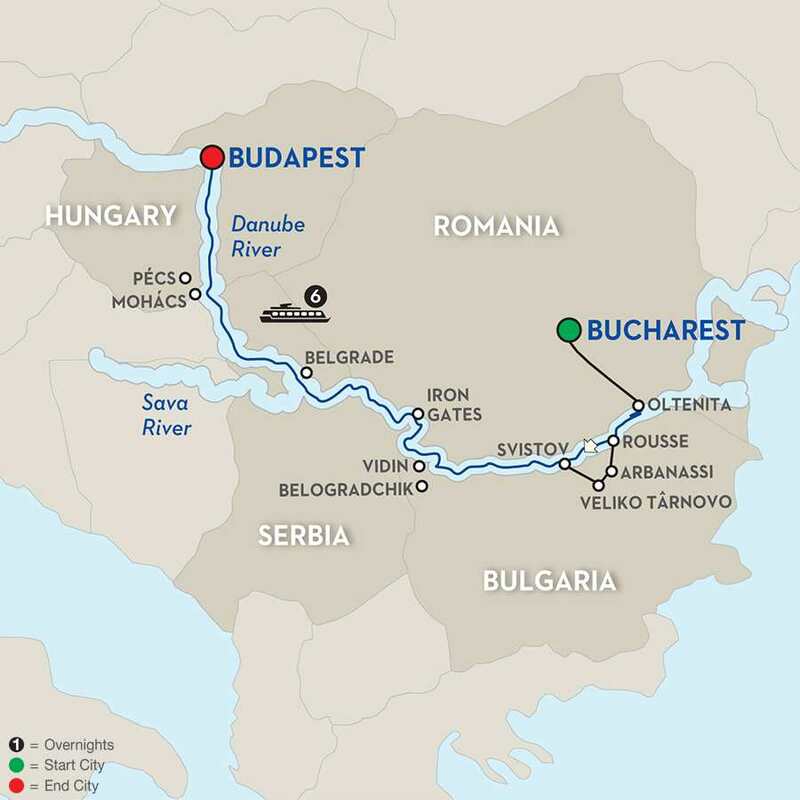 Your journey ends with disembarkation in Budapest, Hungary’s lively capital. In the early afternoon a motorcoach ride takes you to Oltenita, where your river cruise vessel is docked. Before dinner, meet your crew at a welcome reception. In Rousse this morning, you may choose to join a Certified Local Guide for an included CITY TOUR, rejoining your ship in time for lunch and enjoying a pleasant afternoon of cruising to Svistov. Alternatively, you may take a full day excursion to the ancient Bulgarian capital of Veliko Târnovo. Situated on three hills surrounding the Yantra River, the city was a natural fortress with ancient stone houses clinging to the steep slopes. The oldest part is Tsarevets Hill, home of the ROYAL FORTRESS, and the Patriarch’s Church. Then, journey to Arbanassi. Founded in the 15th century, the historic village of Arbanassi is best known for its examples of Bulgarian Revival architecture and its ETHNOGRAPHICAL MUSEUM, a 400-year-old house preserved as a museum. Visit the CHURCH OF THE NATIVITY, one of the oldest churches in Arbanassi, and see its outstanding collection of frescoes. Rejoin your ship in Svistov. After breakfast today a Local Guide shows you Vidin, an important Danube port in northwestern Bulgaria. Its medieval FORTRESS, known as “Baba Vidin,” served as Vidin’s main defensive installation during the Middle Ages and is the only entirely preserved medieval fortress in the country. 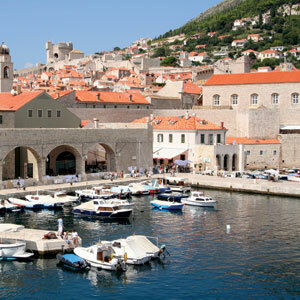 It is the town’s primary landmark and now a fortress museum that has been restored to its former appearance. In nearby Belogradchik view the eclectic group of ROCK FORMATIONS on the western slopes of the Balkan Mountains. Sculpted by natural elements for more than 200 million years and with a variety of sizes and shapes, the Belogradchik Rocks are spectacular! The TRAJAN TABLE marking the Roman conquest of Dacia and the Serbian fortresses of Golubac and Smederevo are impressive sights on the left bank of the Danube. The most spectacular scenery must surely be the dramatic gorge of the IRON GATES, a narrow and formerly very dangerous passage dividing Europe’s Alps in the northwest from the Carpathians in the southeast and forming a natural border between Serbia and Romania. In the afternoon, dock at Donji Milanovac, from where a short drive takes you to the impressive LEPENSKI VIR EXHIBITION CENTER, housing archaeological artifacts found in this area and from where you have unique views of the Danube Gorge. 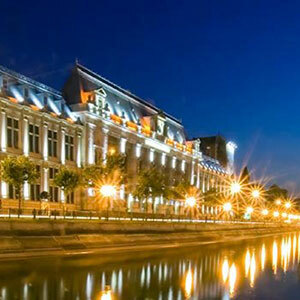 The capital of Serbia is situated at the confluence of the Danube and Sava Rivers. A Local Guide will be proud to show you its main sights, which include St. Sava, the world’s largest Orthodox Church; and Marshal Tito’s tomb and monument. Also visit the city’s principal landmark, KALEMEGDAN FORTRESS, which showcases the history of Belgrade. Built in stages between the 1st and 18th centuries, the fortress witnessed many battles and observed the courage of those trying to defend the city from conquerors. The surrounding park is the most beautiful and largest park in Belgrade. In your free time, be sure to check out the city’s lively pedestrian area and charming outdoor cafés. Depart Belgrade during lunchtime, and head for Hungary. This morning, a GUIDED EXCURSION takes you to Pécs, Hungary’s fifth-largest city. Established by the Romans in the 2nd century, this was a flourishing and important town for Christianity by the 4th century. Pécs is also rich in terms of Turkish architecture and offers Turkish mosques, attractive churches, and an enjoyable atmosphere around its restaurants and cafés. Enjoy an ORGAN CONCERT before returning to your ship for lunch and heading to Budapest. $126Gratuities to Local Guides & Excursion Drivers are included.Please call for single accommodation price. Triples not available.Extra nights not available.